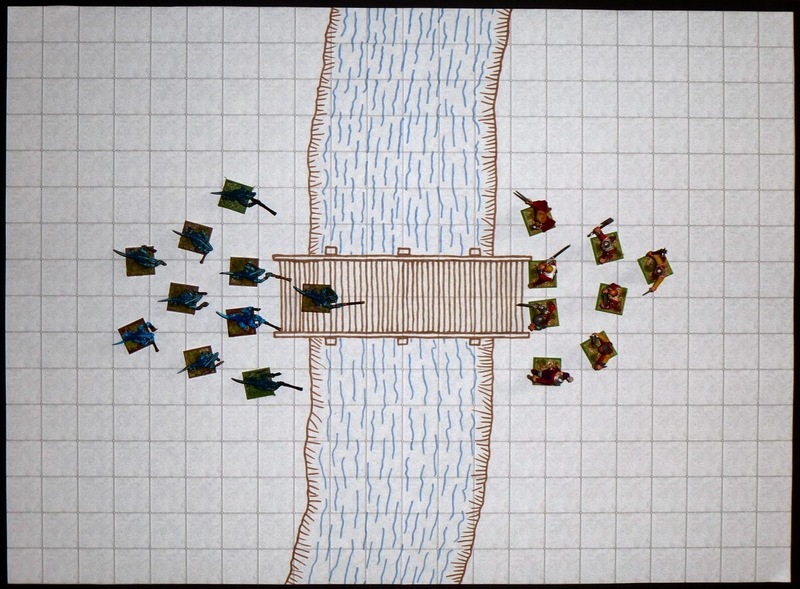 This Battlepad map features a river and a wooden bridge. 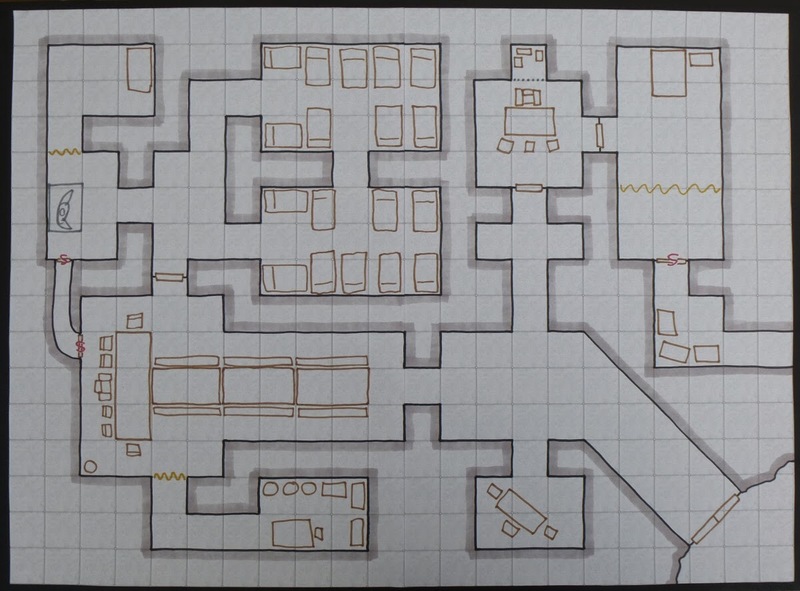 It's a very simple map to draw, but would be great for a quick skirmish game. 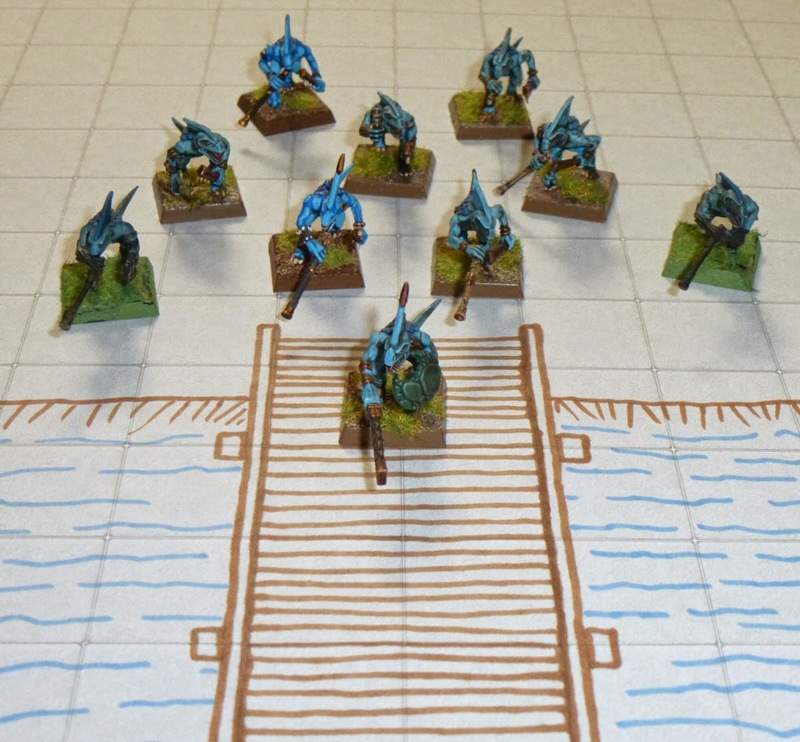 It's shown here with a Lizardman raiding party about to clash with the local militia. 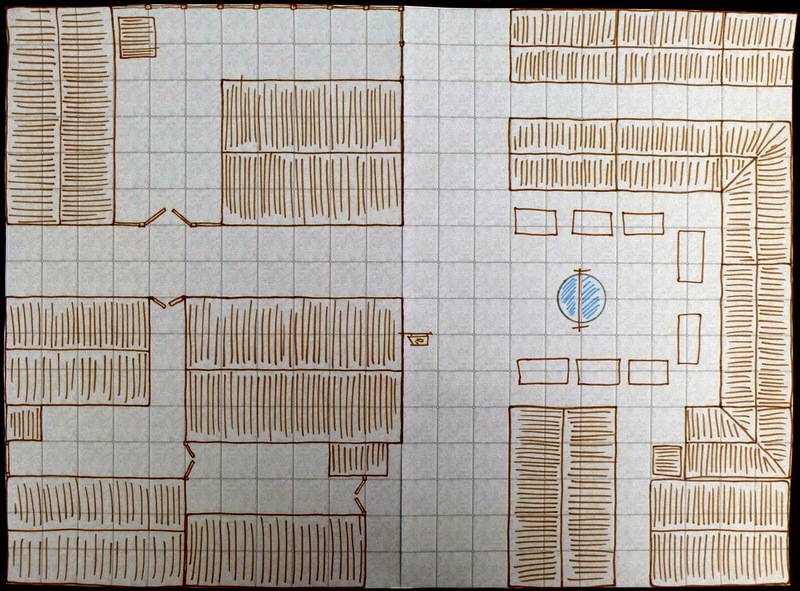 The sheet used for the map is currently being funded on Kickstarter. The campaign has already met its goal and closes Today in less than 4 hours! 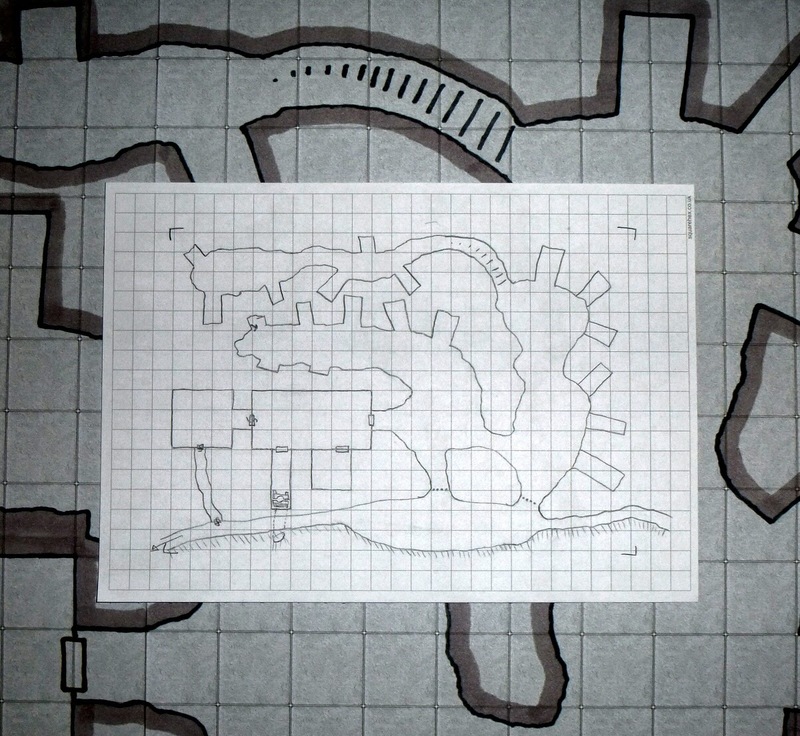 This Battlepad map features a mountain path that leads to a small mine. while drawing it I imagined it to be run by a tough, mean gang of seven dwarves. The sheet used for the map is currently being funded on Kickstarter. The campaign has already met its goal and closes on Monday 30th June so there's just over 24 hours to go! 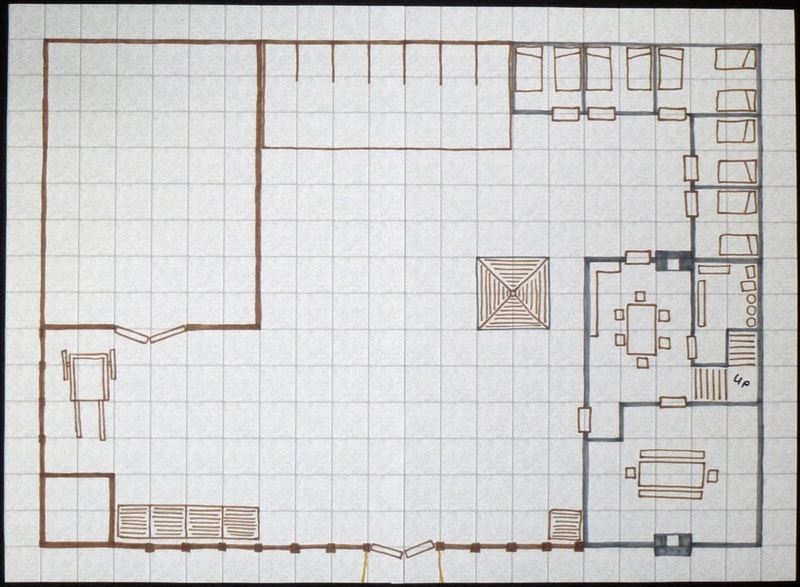 This Battlepad map features a Borderlands Farmstead. 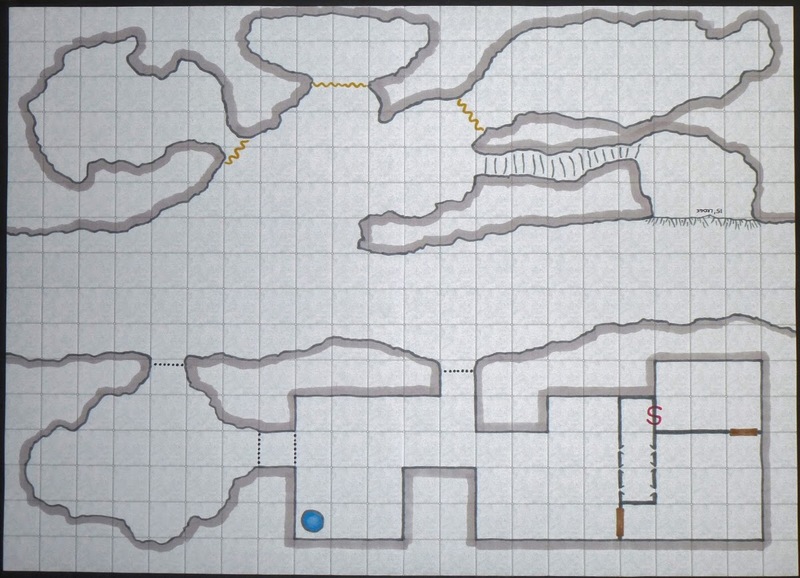 The sheet used for the map is currently being funded on Kickstarter. The campaign has already met its goal and closes on Monday 30th June. 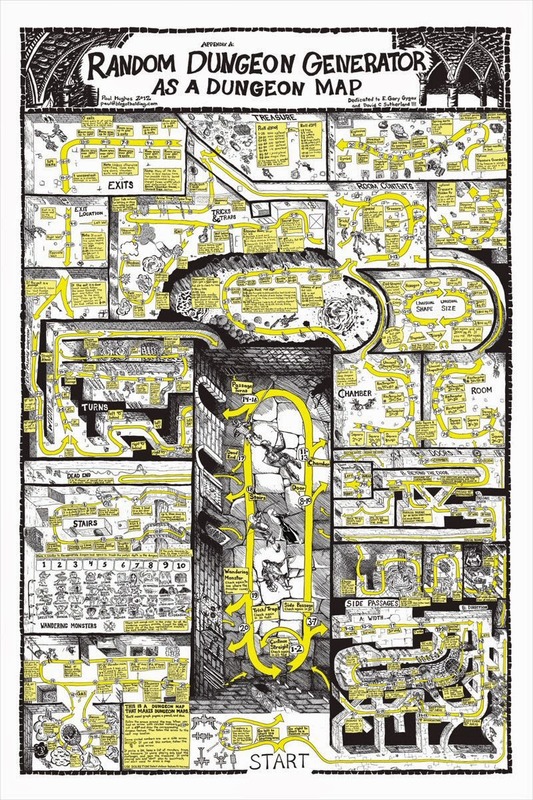 This Battlepad map features a small section of an underground road. The road is blocked in the centre of the map by a cave-in. The only way to get through is by paying a toll to the Hobgoblin unit that have control of the passageway though. The Hobgoblins are highly organised and keep a series of strong steel gates in the area locked until they receive payment. I've been taking my daughter to the park a couple of times a week while the UK enjoys what is shaping up to be its best summer in quite a few years. As she plays, I sit quite happily on a bench and scribble gaming notes, ideas, and maps. Some days I come home with very little, but today I was rather pleased with my efforts. I'll get a few of these worked up in pen and also do some A2 versions over the next couple of days. Meanwhile, in Kickstarter land the Battlepad project has reached its goal and the 1st Stretch Goal. There's still 5 days to go, so it should easily make the 2nd Stretch Goal (less than £50 to go as I type). 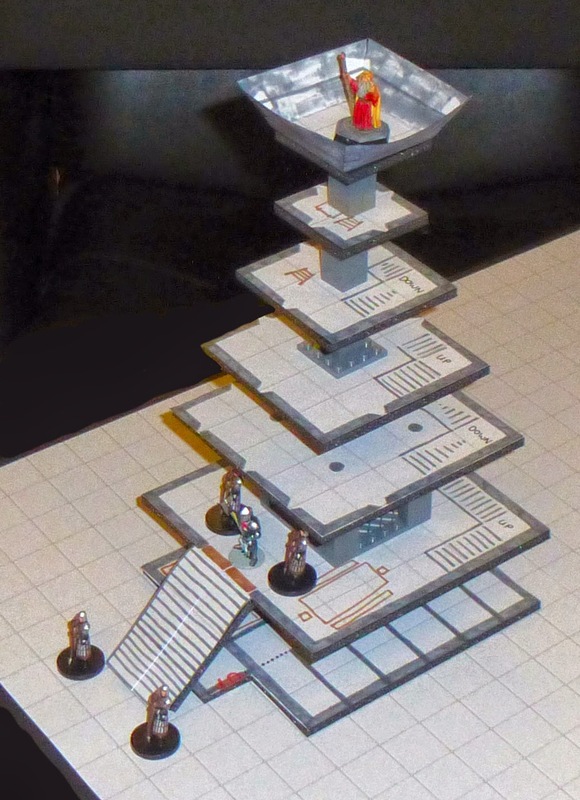 I've released a PayWhatYouWant PDF on RPGNow.com to support the A2 Battlepad Kickstarter. 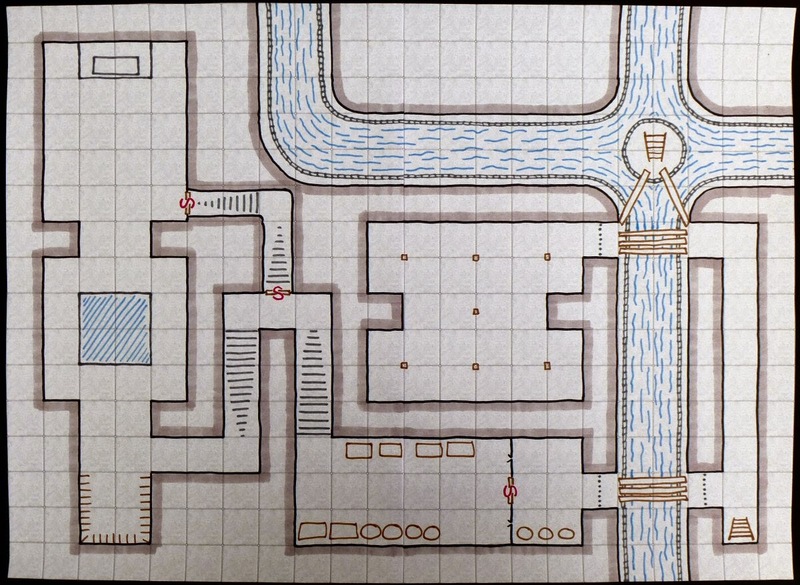 Battlepad Maps is a collection of 12 hand-drawn fantasy maps. 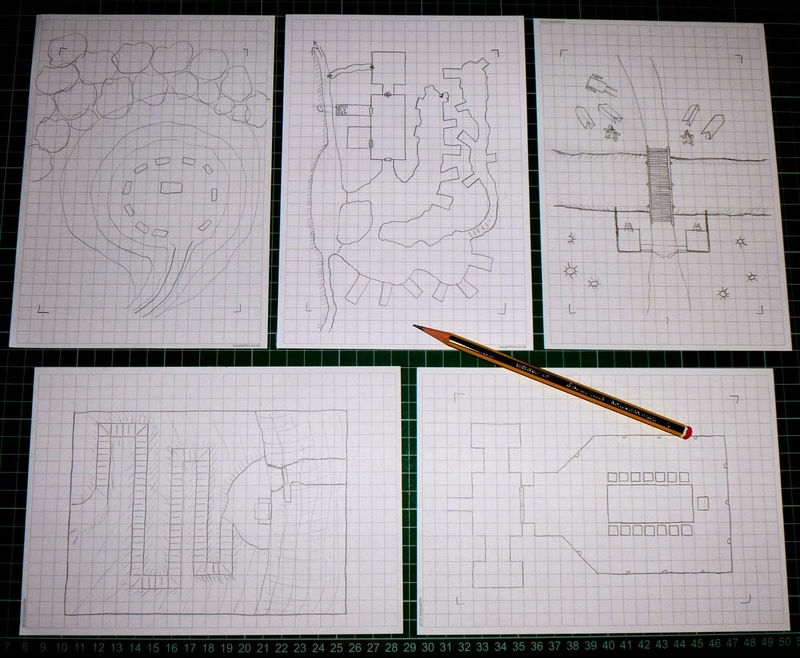 Two versions of each map are included, one blank, and one with title, scale and numbering added. The maps are ideal for dropping into an existing campaign, and may easily be extended or altered to suit your requirements. 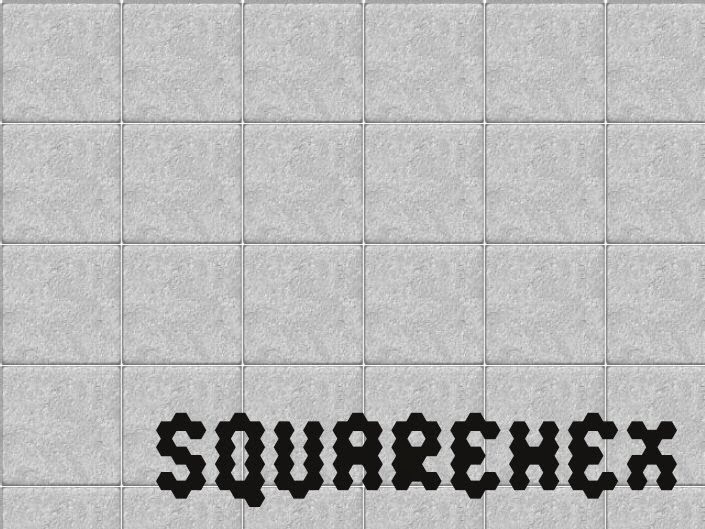 Each map is drawn on a 23x16 grid to match theA2 Battlepad sheets. 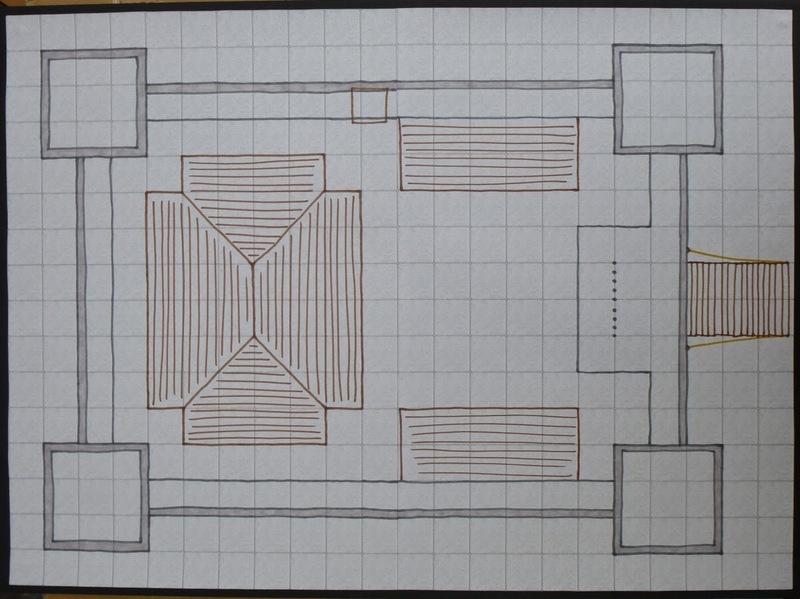 Today's map isn't actually a map but a set of floorplans cut from a couple of A2 battlepad sheets. 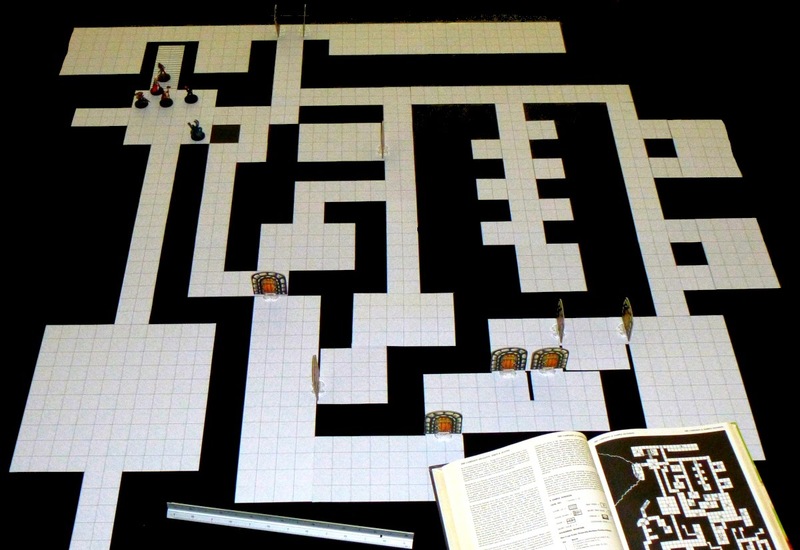 The dungeon is the sample one from page 95 of the Dungeon Masters Guide. 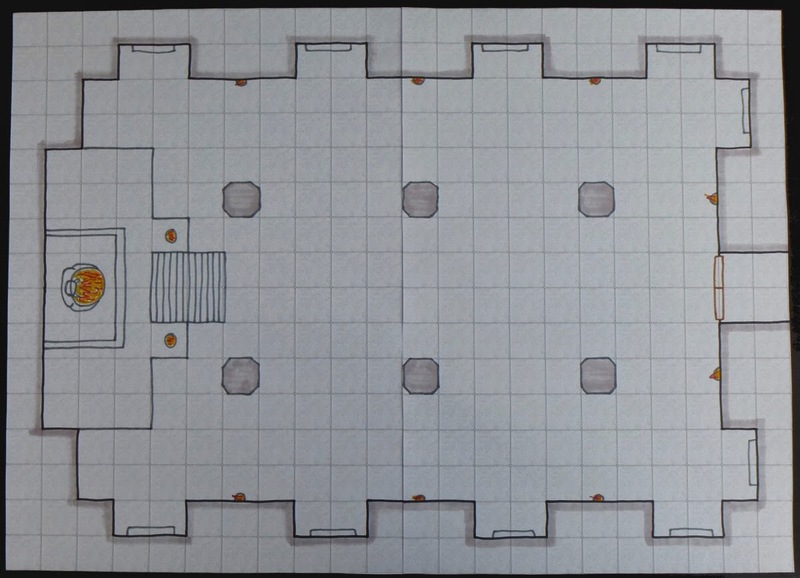 I cut the floorplans just to show another use of the Battlepad sheets. 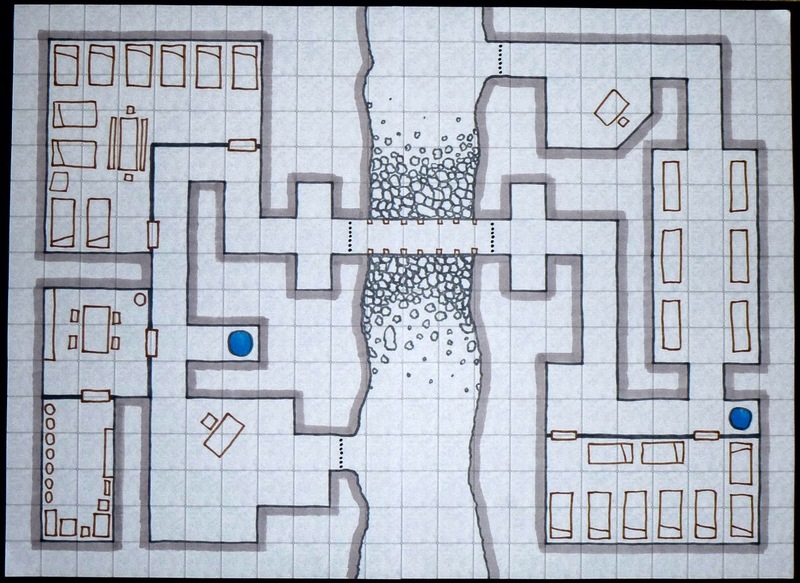 Using them this way is great for creating large dungeons. 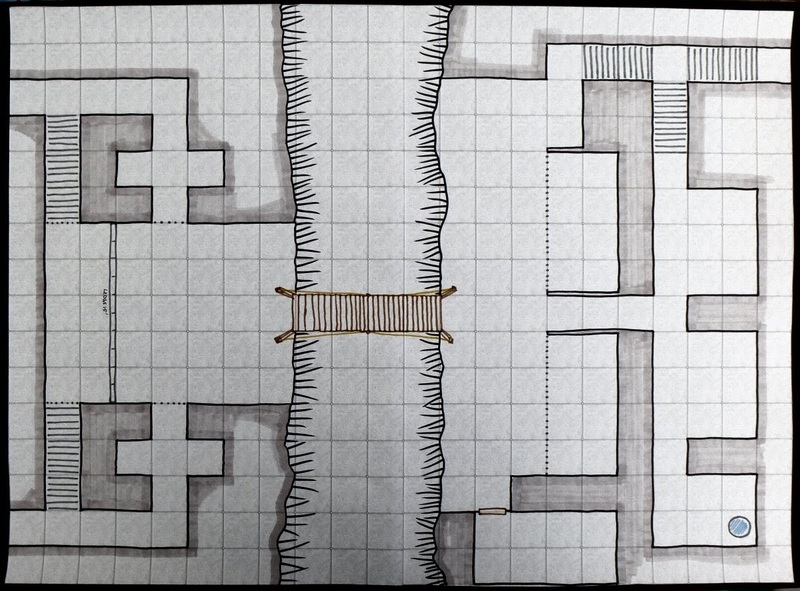 The portion of the dungeon shown here is almost 4'x4' so drawing it on a standard Battlemat or even a larger Megamat presents problems. 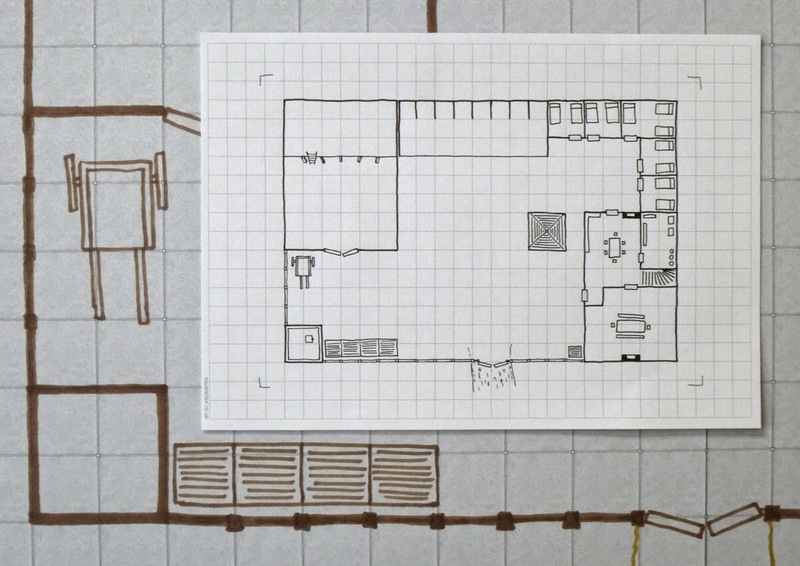 The sheets used for the floorplans are currently being funded on Kickstarter. I drew 2D floorplans for a tower earlier this evening, and then remembered I had some black foamboard off cuts lying around. A short while later, and with the addition of a few lego support columns, my plans were transformed into a 3D version. The sheet used for the map is currently being funded on Kickstarter. This Battlepad map features a small section of an underground road with many interesting locations. 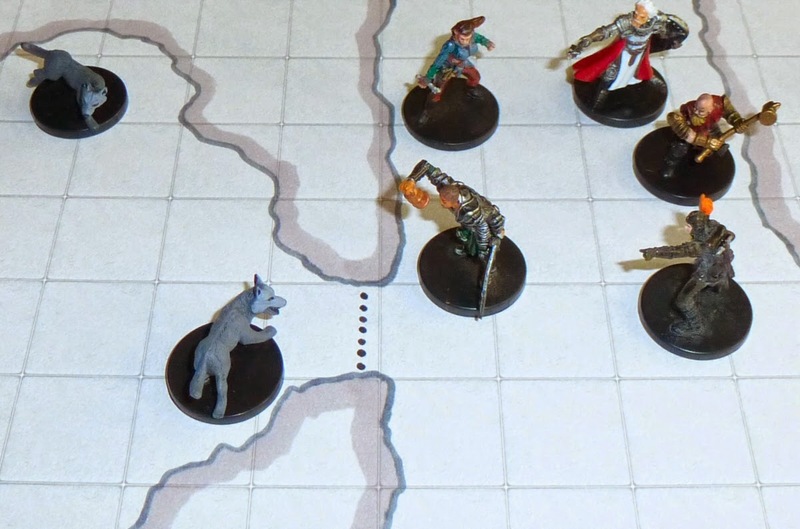 A group of goblins and their pet wolves reside on one side, and, in the caves on the other side, 3 trolls each have a cave. The goblins stay out of the trolls way as much as possible, but will wake them to deal with intruders, and then pay them with a barrel of ale. 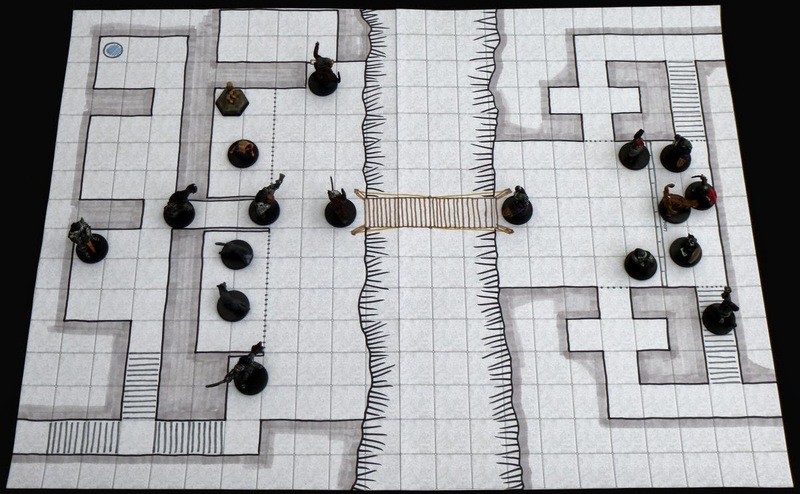 The sheet used for the map is currently being funded on Kickstarter. 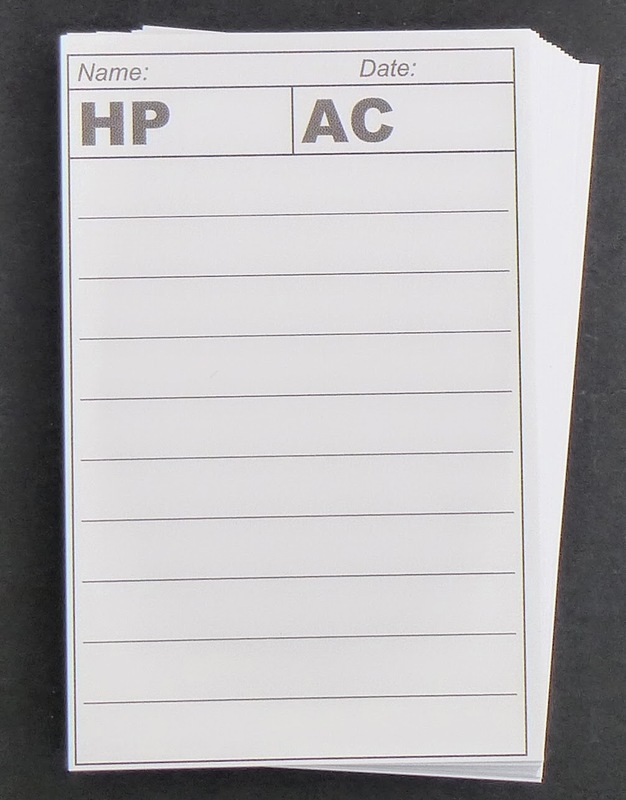 I've added some small (99x210mm) Planner Notepads to the Battlepad Kickstarter. Planner notepads are small (99x210mm) notepads that will be custom printed with a 16x23 grid and lines for notes. 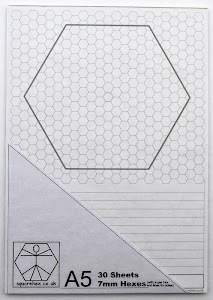 This makes them idea for drawing Battlepad maps in small scale in preparation for a game. The Planner Notepads are available as add-ons or by themselves (see new pledge levels on the Kickstarter page). 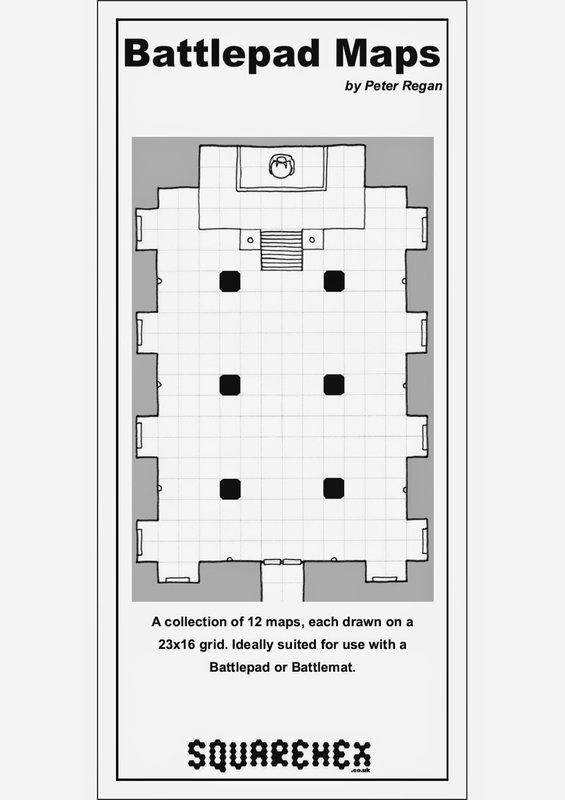 This Battlepad map features a church with an uninvited visitor. 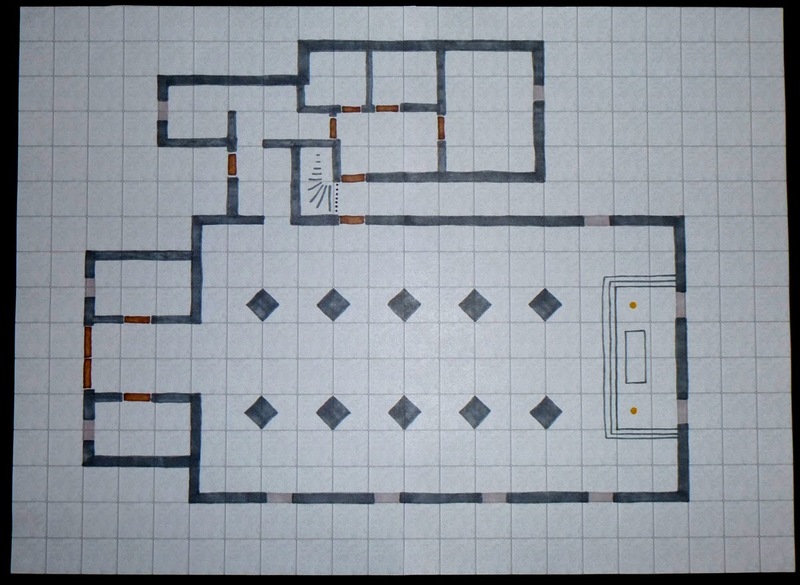 The sheet used for the map is currently being funded on Kickstarter. 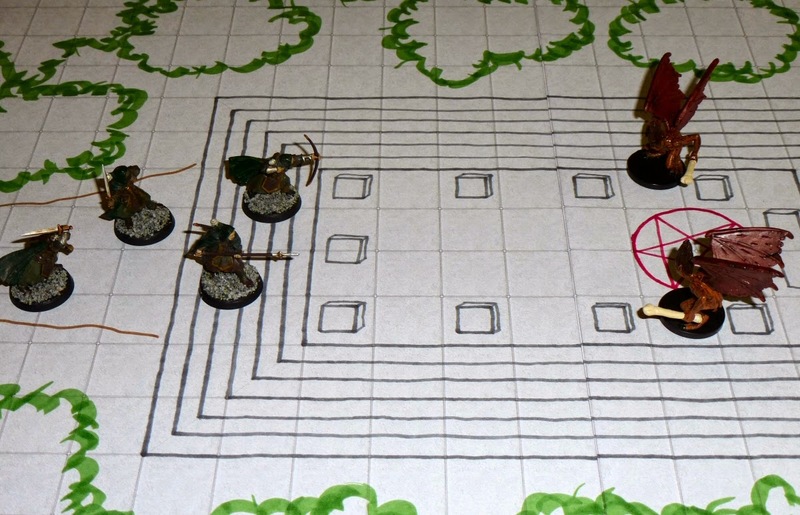 This Battlepad map features a ruined temple in a forest setting. 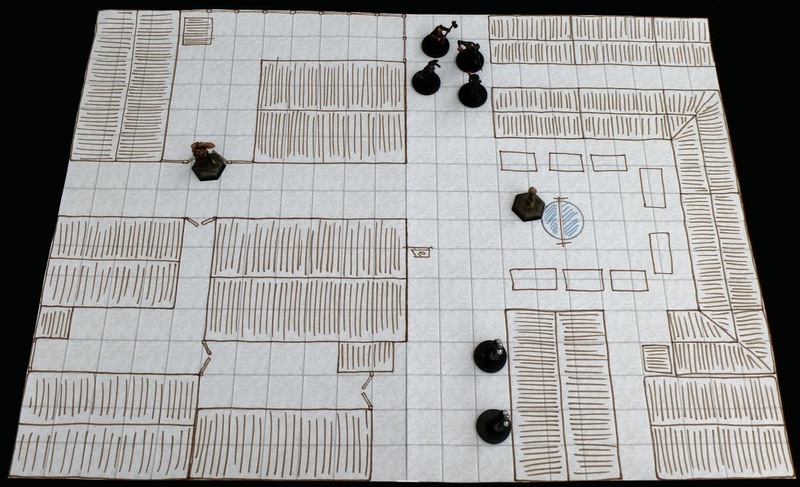 The sheet used for the map is currently being funded on Kickstarter. 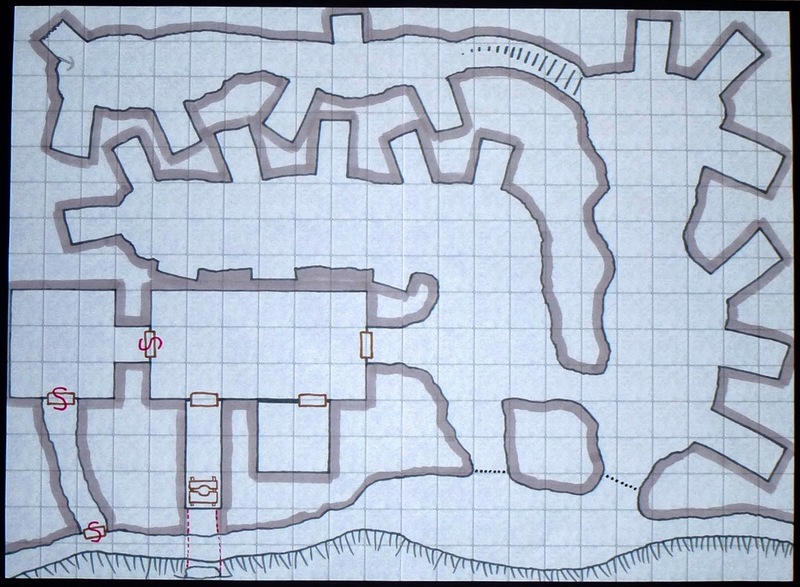 This Battlepad map features a very old school Orc Dungeon. 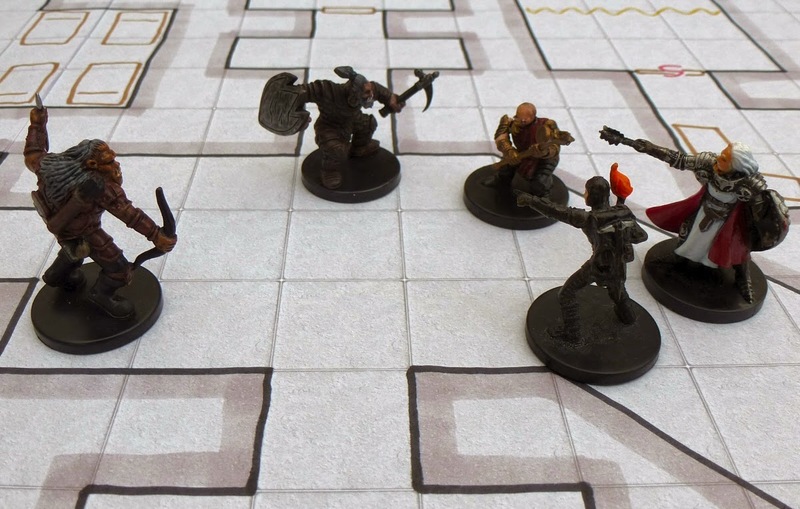 The sheet used for the map is currently being funded on Kickstarter. 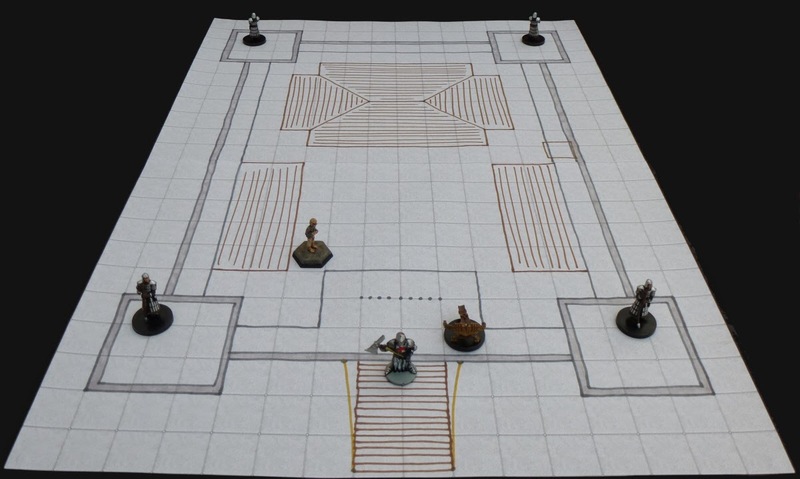 This Battlepad map features a simple keep with 4 towers, ramparts, portcullis and a drawbridge. 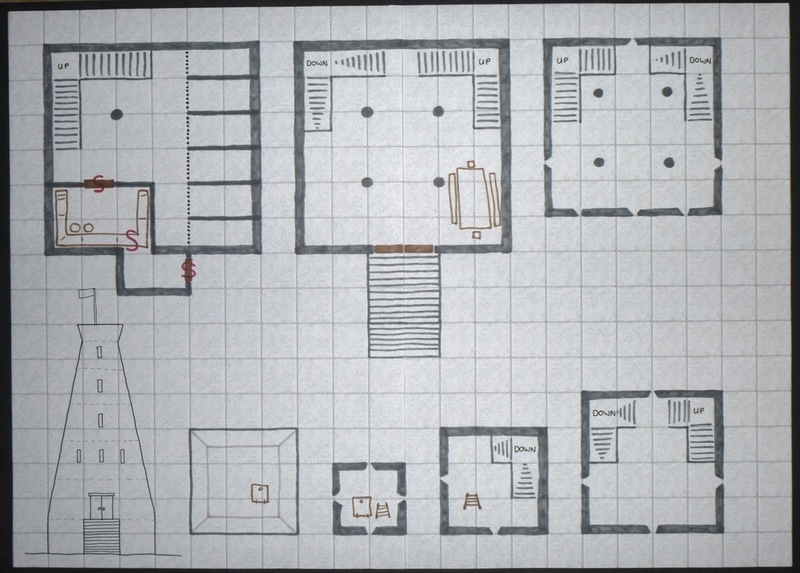 The sheet used for the map is currently being funded on Kickstarter. 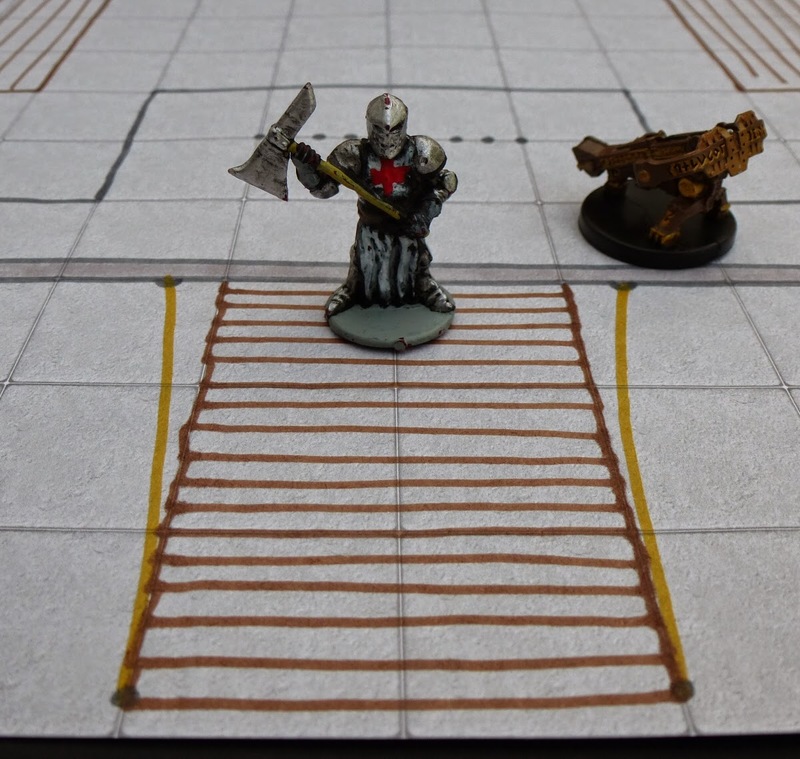 This Battlepad map features a subterranean chasm spanned by a wooden bridge. 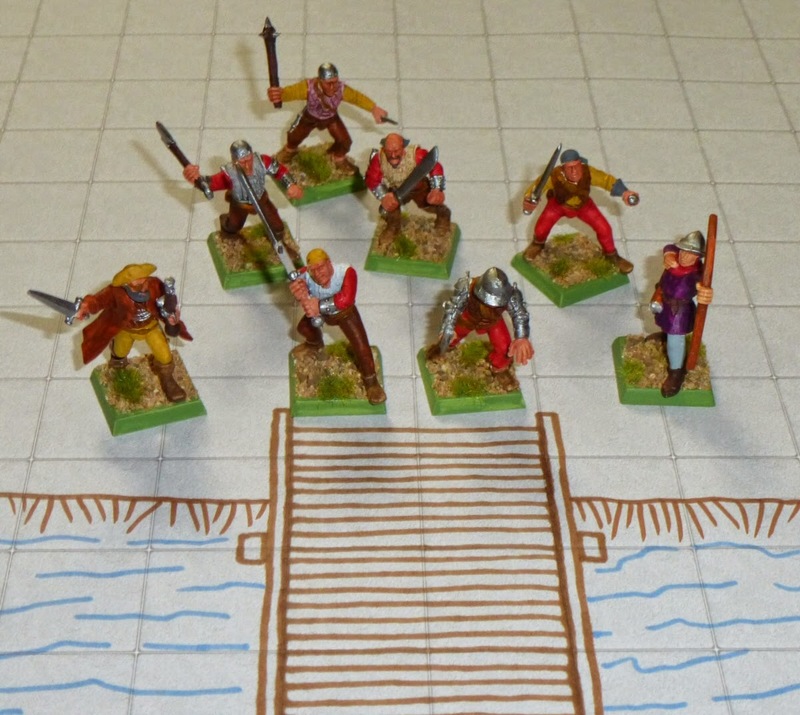 One side of the bridge is controlled by orcs, and the other side by Duergar. There is an uneasy peace between the two sides, supported by trade. 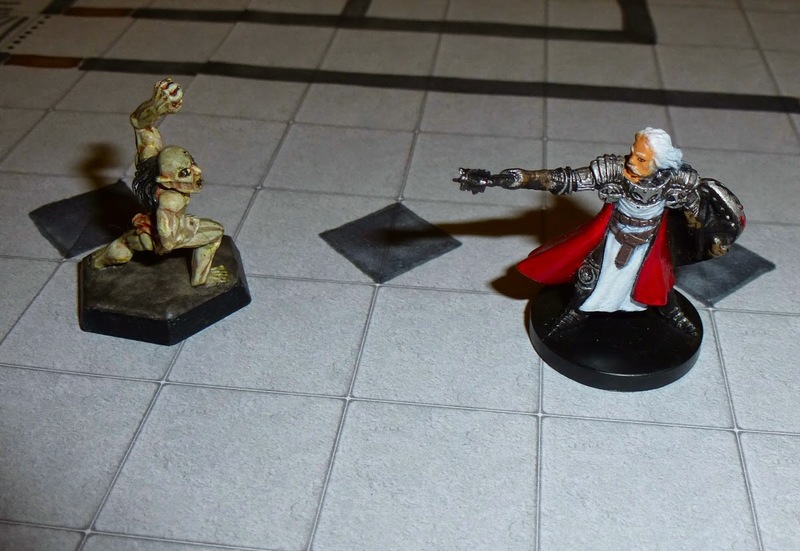 The orcs capture humans on the surface and then sell them to dwarves who put them to work as slaves. 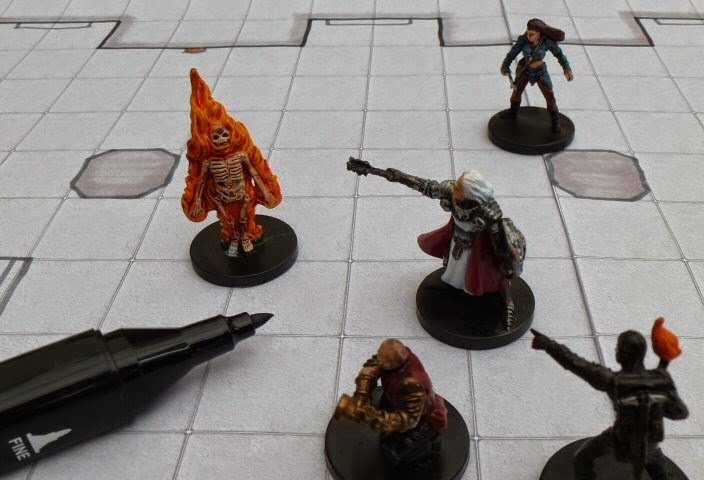 The sheet used for the map is currently being funded on Kickstarter. This village/town Battlepad map includes several buildings and a market square. It could easily be extended in any direction to give as big an urban map as you need. 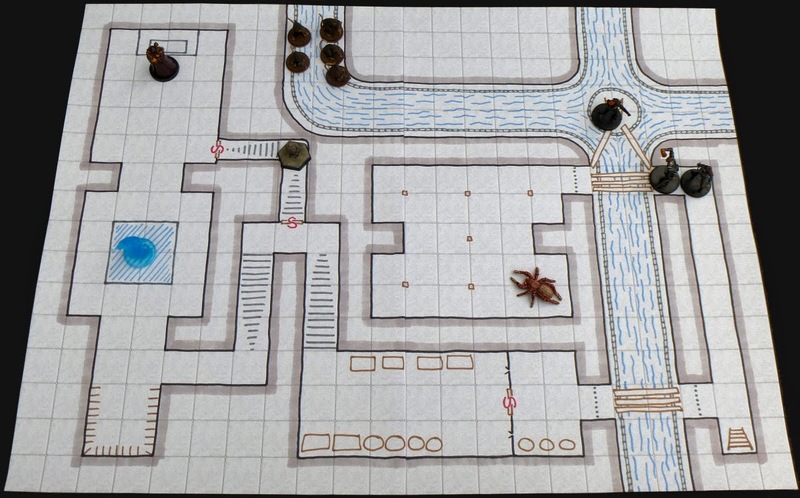 The sheet used for the map is currently being funded on Kickstarter. The Battlepad Kickstarter has got off to a great start. In just over 3 days it has reached 67% of its goal, and only needs a dozen or so more backers to get there. 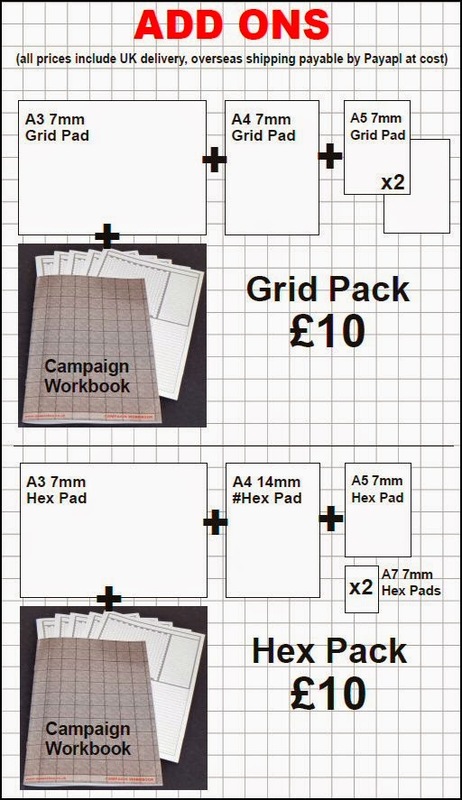 The campaign has several stretch goals ready and waiting, and now I've also put together 2 add-on packs featuring mapping pads from the Squarehex range. 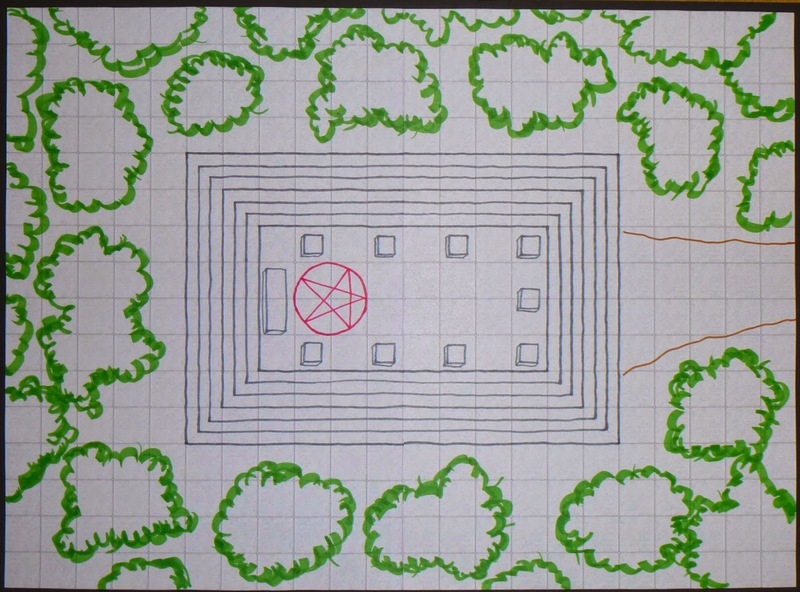 This Battlepad map features a large underground temple complete with roughly sketched Demon Idol. 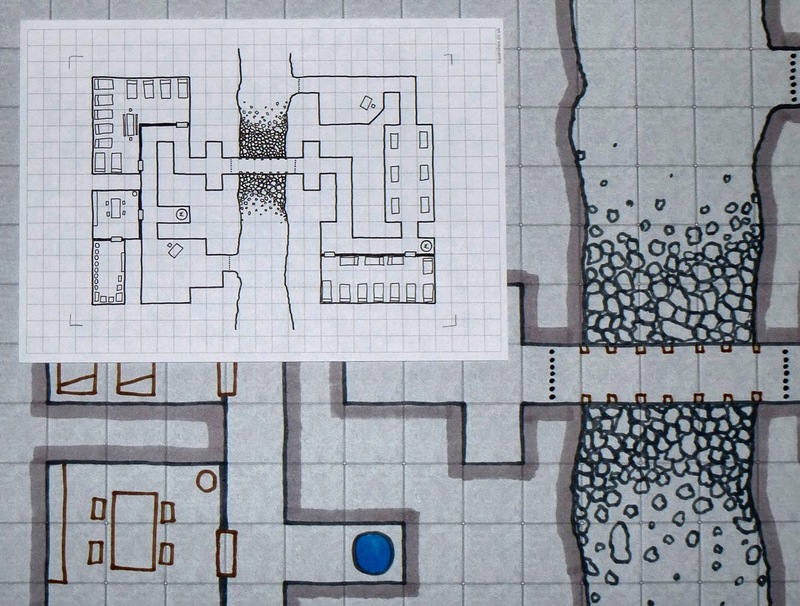 The sheet used for the map is currently being funded on Kickstarter. 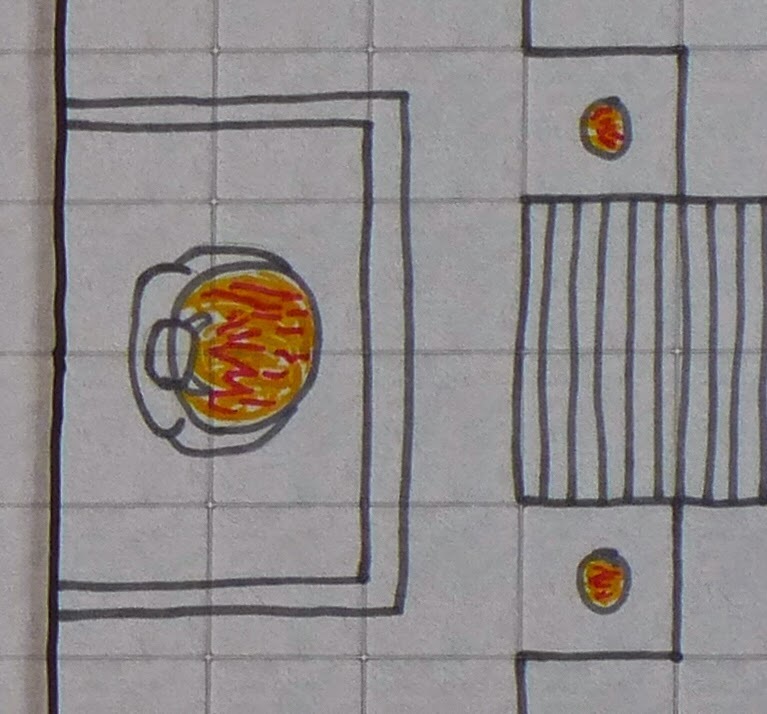 This Battlepad map features a sewer system and a hidden cultist temple. 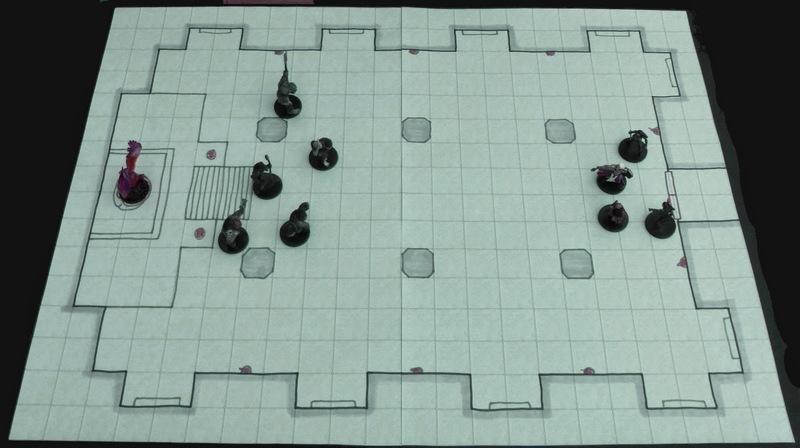 The sheet used for the map is currently being funded on Kickstarter. A pack of 20 Combat Cards intended for use with any edition rules of the world's most popular fantasy roleplaying game. 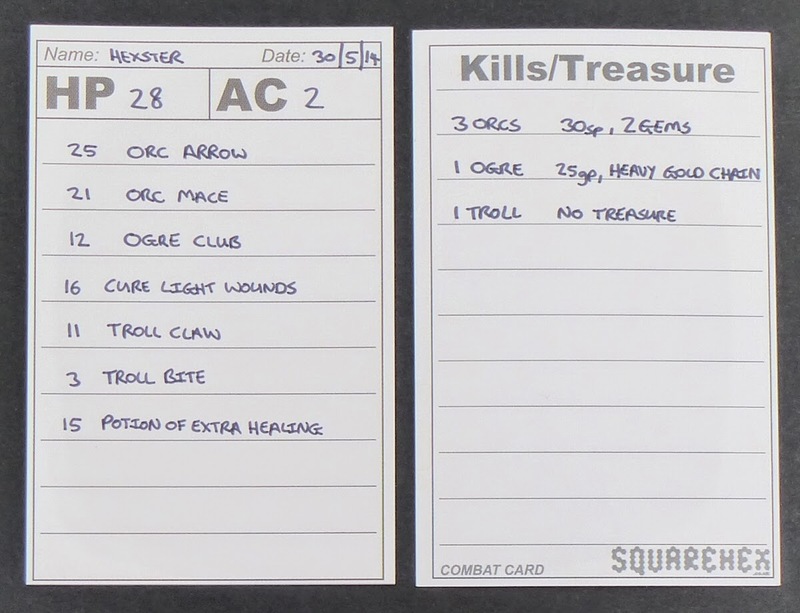 Combat Cards provide a neat way to track wounds, damage, healing, foes defeated, and treasure gained during a single game session. These double-sided cards are the same size as a standard business card (85x55mm), they have been professionally printed on sturdy matt cardstock. They can be bought from squarehex.co.uk and, for people who just want a pack of these and nothing else, they are also on ebay with cheaper UK postage. My new project is up on Kickstarter. 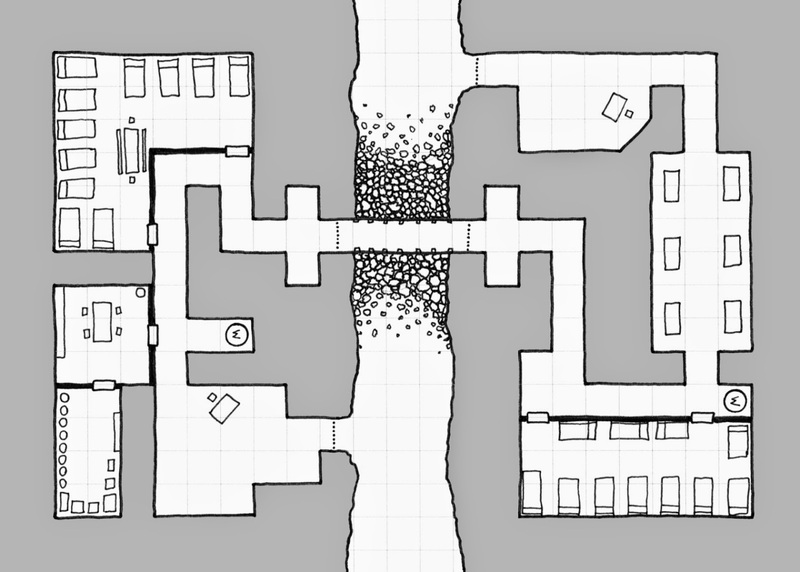 I'll be doing lots of sample maps for this one as usual, which I'll be posting every day or two. The project has got several stretch goals ready and waiting which will add lots of extra value for backers. I'm almost ready to launch my next Kickstarter. The project will be to fund a print run of larger, A2 sized pads printed with a 1" light stone effect grid. I still need to add a few details, and the pledge levels may need adjusting a little after I've double checked all the weights and postage costs. I hope to be in a position to launch it at the weekend. We had a great weekend in Birmingham. Sales were good, and it was a great chance to meet some of our Kickstarter backers and customers in person. 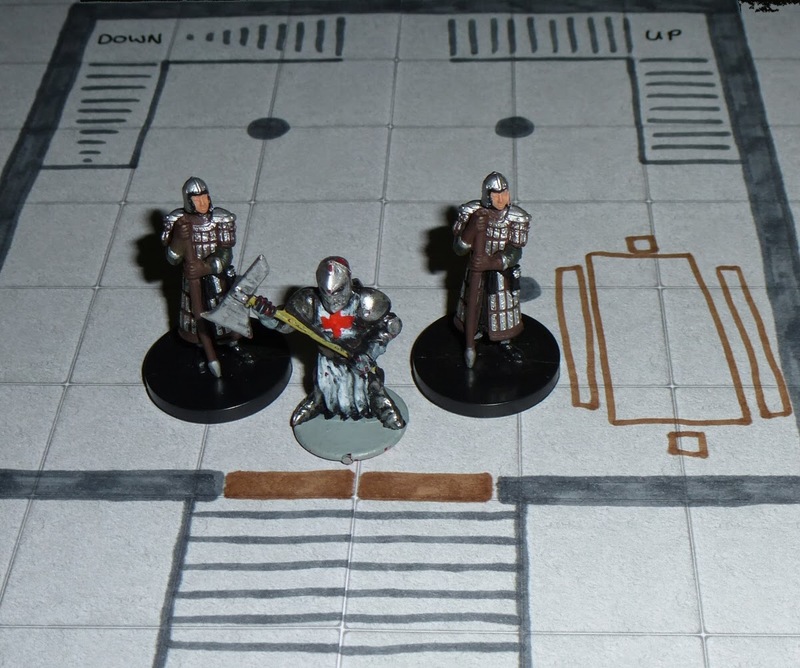 This year we took a mix of boardgames, miniatures, RPGs and our own printed pads. We also had a fresh batch of Random Dungeon posters which were once again one of our bestsellers. We'll certainly be back next year. Later this year we will also have stands at Continuum in Leicester, Derby World Wargames, and possibly Dragonmeet in London. There's a couple of other shows I have in mind but I need to do some more research on them.